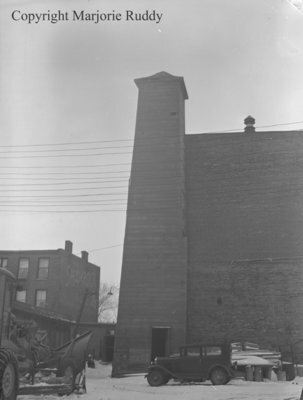 A black and white negative of the bell towers behind the old Whitby Town Hall at 201 Brock Street South. The wooden bell tower at left behind the old Town Hall was built about 1879 when Hopkins' Music Hall became the Whitby Town Hall. The wooden bell tower at left was replaced in December 1919 by the steel tower at right. The siren on the roof at centre replaced the bell in 1931. The old bell tower was used to dry fire hoses until it was demolished in 1948 by Arthur Bradley who salvaged the wood. Bell towers behind old Whitby Town Hall, March 7, 1948, Marjorie Ruddy. Whitby Archives A2013_040_998.